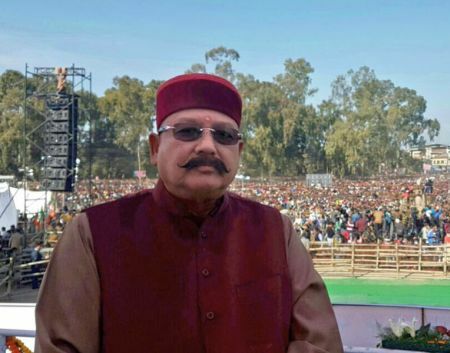 Satpal Maharaj, spiritual guru and former Congress MP who switched his loyalty to the Bharatiya Janata Party, has alleged that he was denied higher responsibilities in the Congress as the party considered him a "Hindu face". Maharaj, who joined the BJP in 2014 soon after Harish Rawat became the chief minister of Uttarakhand, alleged that the Congress is "looking at people as Hindu and Muslim face" and "neither honouring nor respecting" its workers who are loyal to them. He said that Congress leadership chose to ignore his "seniority and capabilities" and gave major posts to Rawat. "I was told in the Congress that I am a Hindu face. You must have seen that Harish Rawat was made the minister at the Centre, then chief minister after Vijay Bahuguna was removed...he was also made state party president. You gave him everything. What about the other leaders. "When I took up the matter, they (senior leaders) told me that they wanted to give Maharaj higher responsibilities as he is an asset. They said how to make Maharaj (the chief minister) as he is a Hindu face. The Congress was taking me as a Hindu face. I thought I cannot change the face but can definitely change the party," Maharaj told PTI. "We are human beings and want to serve the nation. You have to give important responsibility to someone. After I joined the BJP, they told me you go to Rajya Sabha. What are these things? We don't yearn for such things. You are not honouring nor respecting people," he said. Exuding confidence that the BJP will win over 45 seats in the 70-member Uttarakhand assembly, he claimed that people in the state want "change" which could only be possible if the BJP comes to power and there is better coordination between the state government and the Centre. "Now, he (Tirath) is also supporting the party's official nominee. The BJP gives weightage and respect to those people who work for it and keep positive thinking. The party can only grow then. Today, the BJP is ruling in so many states, there must be some qualities in it," he said. On a query that the BJP is becoming "more of the Congress" with over a dozen prominent faces rebelling and joining the saffron party, he said, "When a person joins the BJP and adopts its ideology, then he is no more a Congressman. "When 'gangajal' gets reduced, we add water to it and the added liquid also becomes 'gangajal'. Similarly, when a person joins the BJP, he totally becomes a BJP man and leaves behind the Congress ideology." Asked about the party's prospects in the February 15 assembly election in the state, he said, "We won't be requiring support from other MLAs. "We will be 45 plus. Wherever Modiji is going, we are witnessing a positive impact. We have seen that in Jharkhand. All the star campaigners, which are 40 in number, are campaigning hard at different places in the state which will help us to win. " He also feels that there would be a positive impact of demonetisation in Uttarkahand. "We are explaining the benefits of the move to the people. With Modiji's decision of demonetisation, the counterfiet notes, which were being used to fuel terrorism, have become useless...Naxalite activities have ceased. "People did face the hardship by standing in queues ...also during marriages but this is like a pain a woman goes while delivering baby. One has to bear the pain to be happy later. This demonetisation is giving birth to an honest India." Asked about the party agenda for the state, he said, "We want to establish silicon valley in Uttarakhand so that the youths get jobs. We also want to make the state a tourist hub with world class facilities. We want to focus on various aspects of tourism like religious tourism, adventure tourism, medical tourism." On the race for chief ministership in case the BJP wins, he said, "I would only say that our senior leaders will decide upon the issue after considering the abilities of the candidates. I am a party worker and whatever party decides will be acceptable to me."